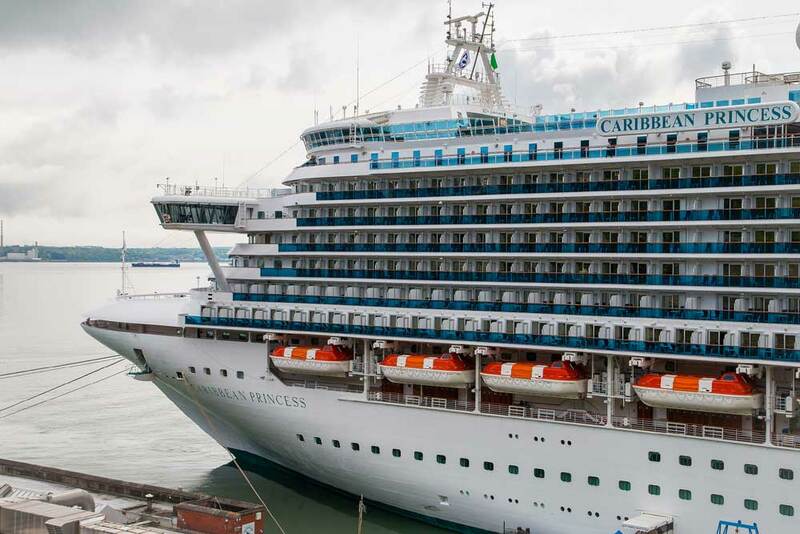 When Caribbean Princess debuts from a two-week, multi-million-dollar renovation on April 6, Princess Cruises will have completed its largest food and beverage innovation to ever take place during a drydock and guests will delight in seven new onboard dining destinations. Breakfast will include 24-hour cereal stations; a designer pancake station with “pancake of the day” stacks; unique hot cereal offerings such as shrimp & grits and polenta porridge. Lunch serves up signature hand-crafted sandwiches, regionally inspired dishes and soups, as well as carvery selections of specialty sausages, hams and roast meats. Dinner selections include breakfast at night with omelets and chicken & waffles, family kitchen comfort foods and a kid-friendly PB&J bar. Night-time offerings will also include a live-action station with stir-fry and customized pasta, plus composed salad choices. Planks BBQ – serving up family-style “Planks” of loaded ribs, beef, sausages and chicken plus all the fixings – fries, chili, coleslaw, charred toast and dill pickles. Dinner is served by wait staff for a cover charge of $12 per person. Complimentary buffet-style breakfast and lunch options include savory customizable breakfast bowls and signature soup, freshly tossed salads and fork & knife sandwiches. Steamers Seafood – offers east coast-style Steamers with regional flair including Black & Blue Mussels, Scallops & Sausage, Classic Clams, Shrimp and Sausage and Broiled Scallops, Shrimp and Crab-stuffed Flounder. Dinner is served by wait staff for a cover charge of $12 per person. A delectable lobster tail and King Crab legs can be added for $10. Complimentary buffet-style breakfast and lunch options include specialty egg dishes and ramen bowls with regionally-inspired broths. The Salty Dog Grill (formerly Trident Grill) – guests can indulge in “The Ernesto” burger, as well as signature Princess burgers grilled up with 100 percent handmade beef patties and buns. In addition, guests can choose new Street Tacos of grilled chipotle-lime chicken or roasted sweet potato-green chile with corn tortillas. Loaded fries in tempting varieties include chili cheese and bacon & cheese. Classic hot dogs round out the menu offerings. Slice (formerly Pizzeria) – featuring west coast and east coast offerings, Princess guests will enjoy award-winning signature classic Neapolitan-style pizza. New menu items include Deep Dish Focaccia layered with marinara, meatballs and cheese, California Artisanal Toast including Cali-Avocado or Caprese, as well as Sliced Stromboli, an east coast take on an Italian calzone filled with deli meats and cheese. Coffee & Cones (formerly Scoops) – offering treats of gourmet ice-cream sandwiches, complimentary ice cream cones and now brewing specialty coffee on the top deck, serving New Grounds Crafted Coffee. The Mix (formerly Blackbeard’s Bar) – the poolside bar will be updated and redesigned with vibrant colors (full designs will be completed by fall 2017). In addition to the food and beverage innovations, Caribbean Princess will emerge from drydock with new offerings appealing to families, including Camp Discovery Youth & Teen Centers, upgraded Movies Under the Stars, Princess Luxury Bed and interconnecting staterooms, just in time for the upcoming Europe summer and fall Caribbean seasons. The cruise ship will also be wired for the Ocean Medallion launch that will be available for the 2018 summer Caribbean season.